Score the fish and add a pinch of salt on both sides. Transfer fish to metal steaming tray (you will want to collect the juices from steamed fish as part of the sauce). 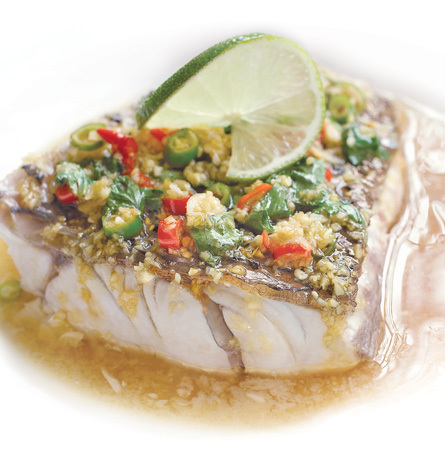 Add coriander leaves, lime juice, green & red chilli padis, minced garlic, palm sugar syrup and fish sauce to a mixing bowl and mix well. Steam the fish for about 8-9 minutes. Remove fish from steamer let it rest for 1-2 minutes. Heat up peanut oil in a pan. Transfer fish to plate with all the juices. 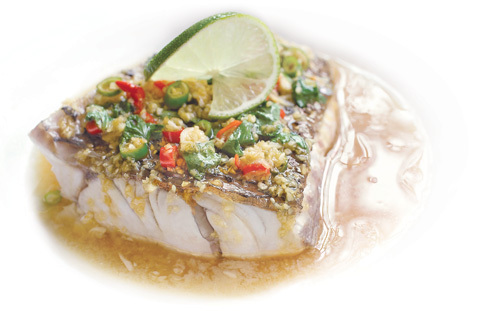 Spoon lime sauce over fish. Pour sizzling peanut oil over fish.